Larne extended their lead at the top of the Bluefin Sport Championship to four points following Saturday’s round of fixtures. Thomas Stewart and Jeff Hughes were on target in the 2-0 home win over Degview. Jordan Hughes’ hat-trick sealed a comeback for second placed Dundela as they shared the points with Ballyclare Comrades. HW Welders edged out Knockbreda with the PSNI securing a narrow win at home to Limavady. Ballinamallard picked up another point on the road at Loughgall. Larne moved four points clear at the top of the Bluefin Sport Championship table thanks to a 2-0 victory over Dergview but it was a victory that came at a cost for Tiernan Lynch’s team. Indeed, it was a mixed afternoon for Red striker Tommy Stewart who opened the scoring at Inver Park on 25 minutes. A clever through ball from Marty Donnelly released the former Linfield and Derry City hitman who showed all his experience to turn inside the defender, drive home and set the league leaders on their way to victory. However, Stewart’s joy was tempered shortly after when he had to be stretchered off the field with a nasty looking injury that Lynch will hope won’t keep him sidelined for too long. Stewart, being watched by his close friend, Northern Ireland international Niall McGinn who was guest of honour for the game, was replaced by Davy McDaid as the sides turned around with just that solitary goal between them. Larne began the second half attacking the Bleach Green end but found the Dergview defence a tough nut to crack in front of a crowd of 796 spectators. The did eventually make the game safe when Jeff Hughes rose highest from a corner to head in his first goal at Inver since returning to the club. With Ballyclare holding Dundela, this could yet prove a crucial win for Lynch’s league leaders. An entertaining game played in wet conditions started with Dundela taking an early lead in the fourth minute. Jordan Hughes got on the end of a ball played into the box and, after a quick break upfield, he made no mistake with a cool finish from 10 yards. The home side reacted well to the early setback and deservedly grabbed an equaliser in the 32nd minute when a forceful run into the box by Adam Gray ended with him shooting low into the net from 15 yards. The second half saw plenty more action to entertain the supporters of both sides. First to strike were Comrades on 52 minutes when a corner played in by Samuel McIlveen was headed in at the far post by Adam Wright. Comrades looked to have control of the game, when they increased their lead in the 64th minute. Thomas Robinson got free on the right side of the box before skipping past the out-rushing keeper and then firing the ball across the goal, where defender Matty Parker could only knock it into his own net in trying to prevent Joe Tully from scoring. The visitors weren’t finished however and on 74 minutes Jordan Hughes reduced the deficit, finishing with ease after being picked out by a good pass into the box. Dundela completed their comeback in the 86th minute. Lethal striker Hughes was again the man on the spot, heading in from 7 yards from a corner to get his hat-trick. Second from bottom PSNI hosted Limavady United, sitting just one place above them in the league standings. The home side got off to the brightest start and could - indeed should - have registered on the scoreboard when a couple of minutes into the game, Lukasz Adamczyk had an opportunity to put his side in front. Unfortunately his effort was easily collected by Paul Wells in the Limavady goal. Some 10 minutes into the game a fine effort from Limavady’s Sean McCarron came off the PSNI upright, much to the relief of all the home supporters. Adamczyk had the ball in the net for the police soon afterwards but the goal was ruled out for an infringement in the build up before another police effort came off the Limavady crossbar. A wreckless tackle from Limavady’s Gareth McFadden led to the first yellow card on 44 minutes and the resultant free from some 22 yards out saw a sweet kick from Dale Malone float into the top right corner of the Limavady goal. There is no better time to score than on the whistle for half time and Malone’s superb strike gave his team the interval lead. Early in the second half, PSNI had an effort come off the Limavady crossbar and another Adamczyk solo effort into the box fizzled out. Later on another Adamczyk effort was easily saved by Wells and on a good day Adamczyk could easily be taking the match ball home! Late on in the game, Jordan Williamson was called upon to pull off one master fingertip save and Philip Simpson nearly caused the talking point of the game when, from distance, his effort was fumbled to safety by Wells. Despite four regular police players sitting in the stands, this was another excellent fighting display form the PSNI against a very good Limavady side. Robbie Hume was a constant threat and Alex Pomeroy, making his first start for Limavady, had an excellent game despite the Limavady attack failing to penetrate a stout police defence. Full time and it was only that sweet kick from Malone that was the difference between the teams and lifted the PSNI up to eighth position in the league. It is also the first time this season that they find themselves out of the relegation zone. At a very wet Breda Park the early exchanges were fairly even but the visitors gradually gained control in midfield and it was no surprise when they took the lead on 23 minutes. Having gained possession in Breda’s half good passing saw a great cross from the right flank met by Luckas Gwiazda whose header at the back post, from six yards, gave Breda keeper Smyth no chance. Two minutes later Breda’s Zach Barr had his header well saved and the Welders increased their lead on 28 minutes when Chris Morrow fired in from close range after a block by Breda’s keeper fell to him. Breda made two changes at half-time and started to come into the game more, scoring on 74 minutes when a cross from defender Mark Drysdale was met at the back post by centre forward, David Fearon, with a fine header back across goal and over the keeper. This set up a period of sustained Breda pressure but the visitors held on to take all three points. A goal in the 90th minute gave Banbridge Town a deserved point against a well organised Armagh City at Crystal Park. Town were able to welcome back Neil Clydesdale after a period of injury but were still missing five of their first team squad. Despite the persistent rain, both sides made every attempt to play football, encouraged by an almost immaculate playing surface. Banbridge looked as if they might score in the initial exchanges but gradually the visitors settled into their game and began to trouble the Town, especially down the flanks. Nevertheless, it came as a surprise when, in the 20th minute, former Banbridge player Andy Wilson’s left wing cross took the slightest of deflections and that carried over the head of McErlean in the home goal to give the visitors the lead. Immediately after the break, Banbridge substituted McGrath for Clydesdale with the substitute pushed into a more advanced role. Armagh settled into a strong defensive formation and the wide players, Allison and McCreanor, were marshalled by Grimley and Mallon. Banbridge were well in control of the game and McErleans kicks caused difficulties for the home defence. Clydesdale went close with a header and Acheson was, as always, dangerous at set pieces. As the half wore on, Banbridge brought on Gould for McCreanor and changed formation when Stuart King replaced Stuart Thompson. McCavitt gave Banbridge hope when he flashed in a cross from Town’s right only to find that no-one was positioned well enough to take advantage. With the regulation 90 minutes almost elapsed Banbridge equalised when Wilson’s cross dropped to full back Devlin who slid the ball home from eight yards. 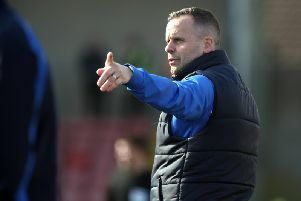 Referee Mr Monaghan advised that five minutes added time would be played and Banbridge almost won it when Moffatt connected with his left foot only to see his effort slip agonisingly wide of a post. Two early fantastic strikes at Solitude saw Lurgan Celtic defeat Newington on a scoreline of 2-1 in the Bluefin PIL. With only minutes played, Aaron Rogers picked up a ball wide on the left hand side and proceeded to fire a shot from distance into the Newington keeper’s top left hand corner. It was a sublime effort from Rogers whose performances recently have seen him selected for the UEFA Regions Cup squad. The Celtic lead was doubled with only 11 minutes played when a hasty Newington clearance was picked up just inside the Newington half by Niall Lavery, who fired a first time shot goalwards and, with the Newington keeper back tracking, the ball sailed into the back of the net. It was an excellent opportunistic strike that demonstrated the confidence Celtic were playing with and provided a fantastic platform for the Hoops for the remainder of the contest. Newington tried diligently to get back into the game and attacked with vigour but with Celtic’s attacking duo of Rooney and Murphy stretching Newington in defence, there was always the chance of Celtic extending their lead further. Newington did have two late chances in the first half, first when a headed effort clipped the outside of the post and then - with time almost up - a drilled effort forced Celtic keeper McKerr into a fine save with the follow up fired over. Celtic started the second half threatening to extend their lead further. First Murphy and O’Reilly both fashioned excellent chances but the final touches on both occasions narrowly missed the framework. As play ebbed from end to end, the Hoops were well organised and led in defence by McCabe with keeper McKerr showing safe hands on the occasion when shots got past the defenders. Celtic did lose right back Andrews to injur, but in Henderson, they had a fine replacement and with a two goal cushion, it looked as though the game was going to be seen through. These hopes were hindered though when Newington pulled a goal back with 15 minutes remaining. A McCann mis-kick ended up becoming a ball across the Celtic goal which a Newington head put past McKerr and into the Celtic net. In the melee that followed this goal, Newington’s Bradley and Celtic’s Lavery were issued with red cards which ensured a fraught remainder of the game for the travelling support. Newington player and a subsequent second red card for Newington’s Taggart, reducing them to nine players for the last few minutes. This created space for Celtic’s attacks. As Newington piled forward in search of the equaliser and O’Reilly, Crawford and Murphy all had fine efforts to put the result beyond doubt but the scoreline was not added to and the final whistle was greeted with much relief and celebration by the away team. Dollingstown returned to The Dub just two weeks after their extra time defeat in the Irish Cup and should have been ahead in the first five minutes. Richard Thompson played in Andy McMath who rounded Queen’s keeper Declan Brown but then shot into the side netting. Queen’s gradually came more into the game and began exerting pressure on the visitors defence. With 20 minutes gone Matt Hughes’s shot was tipped on to the bar by Steven Croft, the ball went out to Chris Middleton on the right and his cross was headed in by Ryan McCready. Ten minutes later Queen’s scored a second in a breakaway. Quick passing led to McCready nodding the ball on for Lorcan McIlroy who struck it powerfully past Croft. Declan Brown made a great save from Thompson to preserve the lead just before the break. Queen’s were dominant in the second half and got a third goal when McCready tapped it in from close range with 55 minutes gone. Croft made a great save, palming away a well struck shot from Middleton and Brown saved well at his near post. On 81 minutes Thompson’s shot was palmed out by Brown and Dollingstown sub, Nathan Lavery, was on hand to score at the second attempt. Philip Trainor came on for his first appearance since injuring his ankle in pre-season and was unlucky to see his header rebound of the post and into the grateful arms of keeper Croft as Queen’s easily saw out the final minutes. On a cold wet day at Tandragee Road it took 30 minutes for any real entertainment. A long ball from Jordan Lyttle saw the Moyola centre-half’s header fall short. Scott McCordick was left one on one with the keeper but failed to convert. Five minutes later Jackson Holmes broke the deadlock with a composed finish into the bottom corner after a cross from Craig Taylor seeing Jackson free in the box. It didn’t take long after the restart for Annagh to double their lead. Some great midfield play from Gault and Henderson seen the ball go wide to Taylor and McCordick was on the end of his Cross to finish off a great spell of possession. Annagh took the foot off the gas and allowed Moyola to grab one back. It gave the away side belief they could get something and could have had what looked like a stone wall penalty claim. Two minutes later they hit the crossbar and the rebound cleared off the line but Annagh rode the storm and made some tactical substitutions when all three substitutes combined to make it 3-1. Jordan Campbell’s pass found John Uprichard who done well to cross and find Ben Eagle with a cheeky finish off the back heel. Annagh sit top of the tree with four wins from four. Tobermore United hosted Portstewart at a wet Fortwilliam Park on Saturday afternoon. The home side took the lead on 32 minutes after a free kick from Ryan Whiteside was headed home by Conor Kearns. The home side dominated possession and on 54 minutes Kearns and Thompson forced an excellent double save from the Portstewart keeper. Four minutes later and Tobermore doubled their lead courtesy of a Peter Duffin strike. Portstewart came looking for a goal but the shot was palmed away by Bednarz. Tobermore made it 3-0 on 68 minutes through a Shay Dunlop strike from outside the box. Two minutes later Tobermore had the ball in the net again but the linesman ruled it offside. With 10 minutes left Ciaran Curran scored Tobermore’s fourth. Five minutes later Portstewart went looking to pull one back but a string of excellent saves by Bednarz kept the score at 4-0. In injury time Jordan Thompson could’ve made it five but his shot was just wide.